Wow, that season went quick! 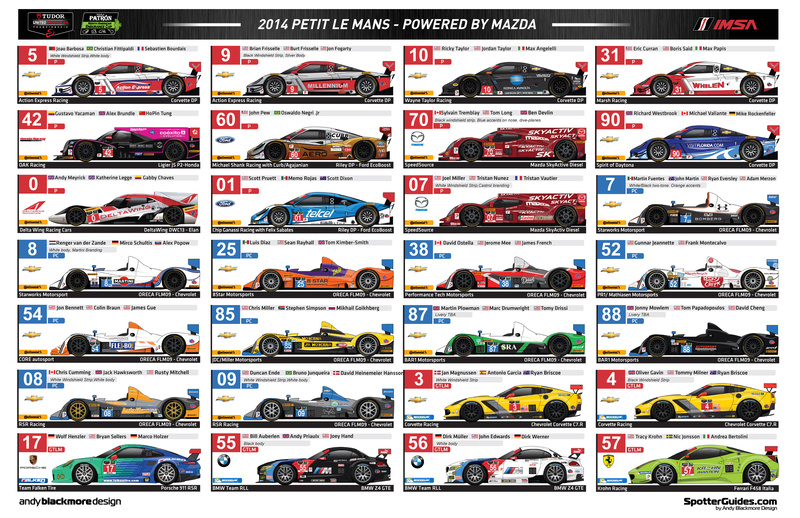 The IMSA Spotter Guide for Petit Le Mans is now online to download as the usual IMSA booklet, or as a 2page 11×17 Poster style layout. Please note, I will be at the event, so there will be no further updates to the guide this week. You can download the guide here. Update: Since the guide was completed on Tuesday, there have been a number of changes to drivers and cars. #91 GTLM Replaced Dominik Farnbacher with Kuno Wittmer. #93 GTLM Replaced Kuno Wittmer with Dominik Farnbacher. #19 GTD Added Mark Kvamme and Daniel Llyod. #45 GTD Added Andrew Palmer. #51 GTD South Aftrican flag graphics added. #73 GTD Added Norbert Siedler. Thanks everyone for their support, we aim to be back next year with more IMSA Spotter Guides!